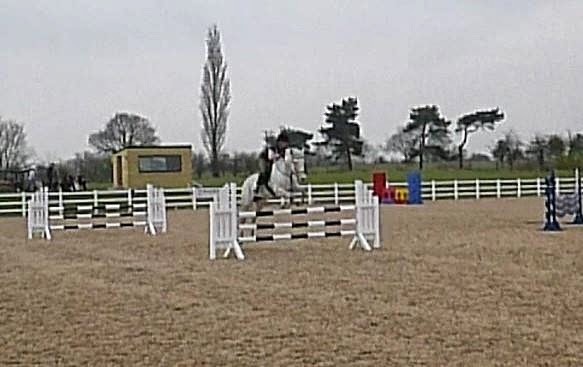 This was his first time in a ridden competition in 18 months following his foot rehab and operation on his back, & his first prelim competition. 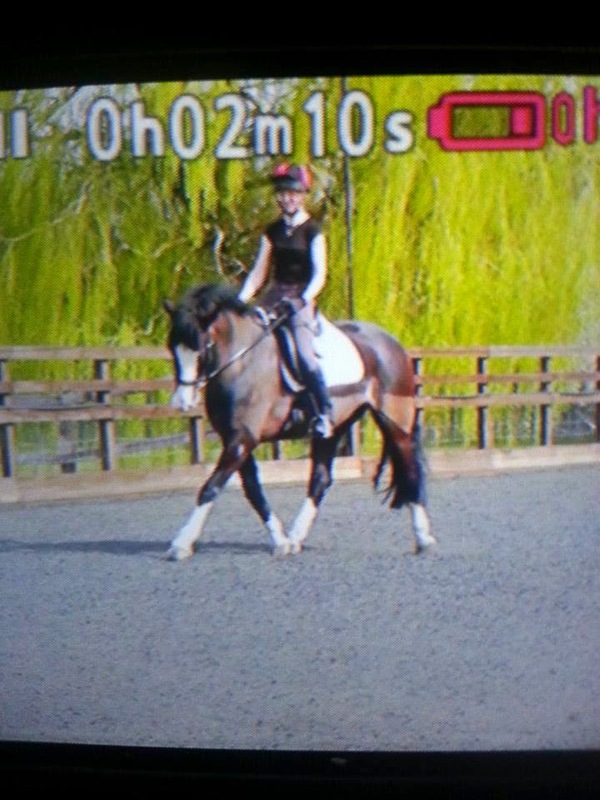 Soooo pleased with my boy!!" Looking fantastic - and again a fitting reward for all the miles and hours they have put in over the winter. Lucy and Fryday are next up, and despite many downs as well as ups over the last few months it looks as if their hard work is undoubtedly paying off! Finally for now - and last but definitely not least - Krista and Buddy who are also looking amazing. What a transformation from the weedy little chap who was at Rockley last year - all grown-up! As always, these horses and their incredible performances are a credit to the tireless hard work, patience, dedication and sheer sweat their owners have put in for months and months and months. Those of you on Facebook will already know that I put my iphone through the washing machine a couple of days ago...! Must be somewhere nearby, surely? Holly has been here for 3 weeks already - I have no idea where the time has gone but apologies to Claire who has been patiently waiting for an update and I'm sorry its taken me till today to get the photos up! 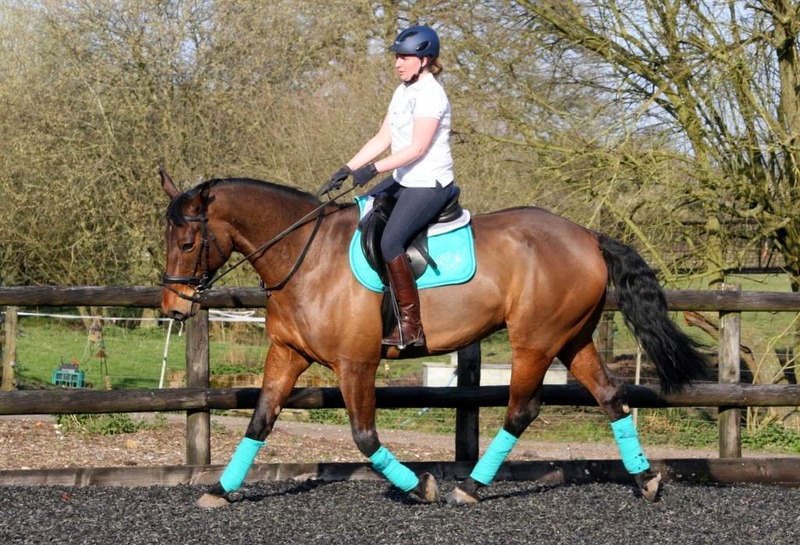 Holly arrived with a medio-lateral imbalance which her feet were also displaying. 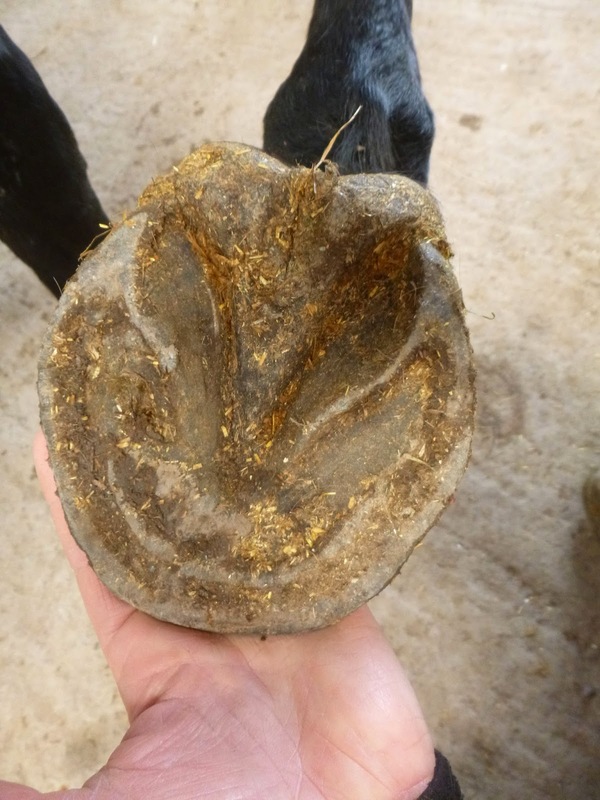 The top photo is her caudal shot on the day she arrived and its clear that the lateral side of this foot (the LF, so the lateral side is on the left of the photo) had been overloading compared to the medial side. 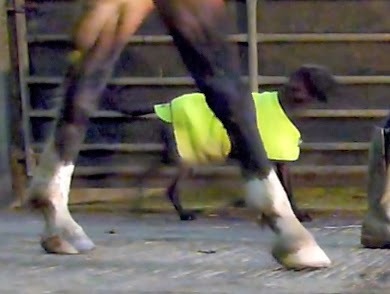 Fast forward 3 weeks and this is the most interesting comparison shot, I think, as it shows a foot which is becoming more balanced. 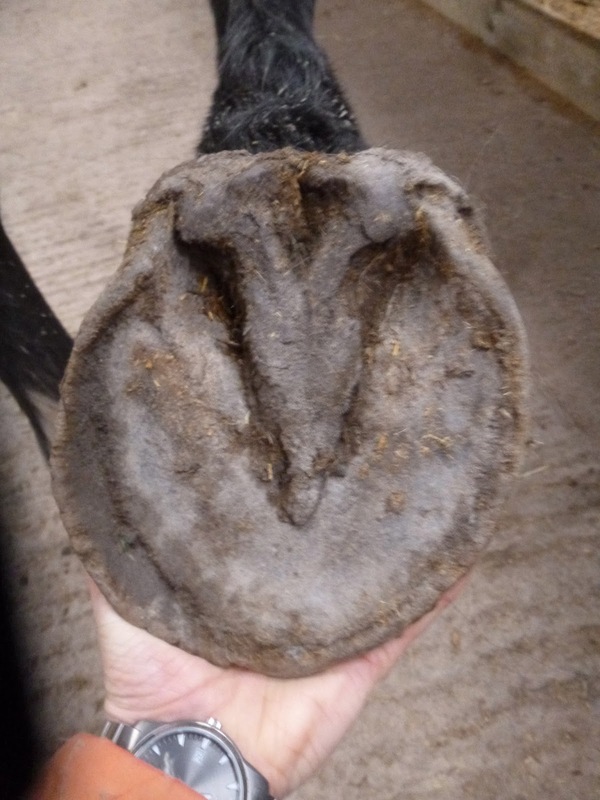 The difference is more subtle on a lateral shot but she has a slightly less under-run heel and a shorter toe and the line charts her hoof capsule growth quite nicely. Same story on the RF, her better foot, but that also had lots of room for improvements, which Holly is now starting to make. The only real solution for this is to grow in stronger and better connected tissue and this is what Holly is now doing. 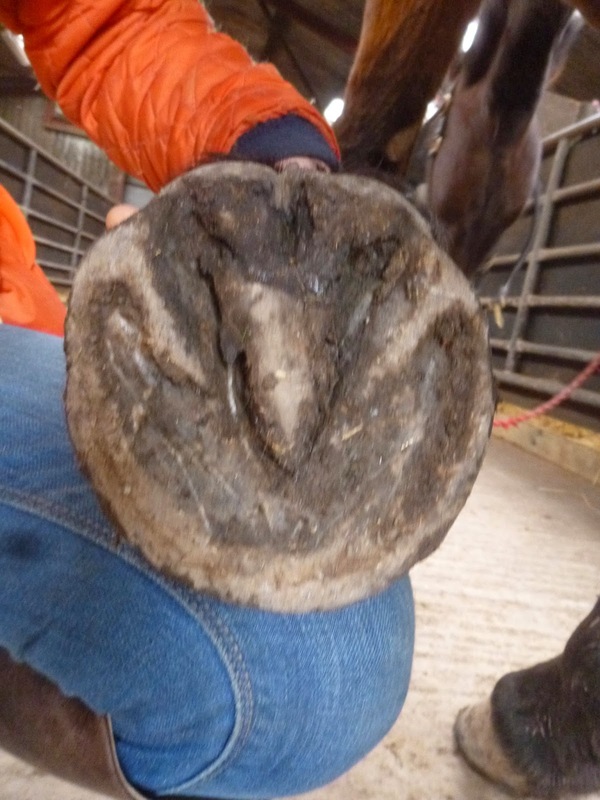 The old, weak growth will still be evident in her sole for some time to come but her sole and bars are already looking healthier. She has a better white line on the lateral side and it will be interesting to see if she maintains that medial deviation or if it continues to reduce, as it has so far. 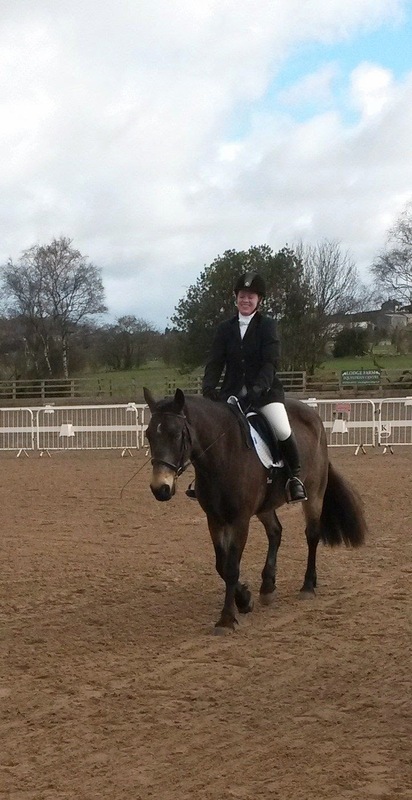 Following on from Monday, another big congratulations to Susan and Abbey, who entered their first dressage comp since Abbey went lame 2 years ago. 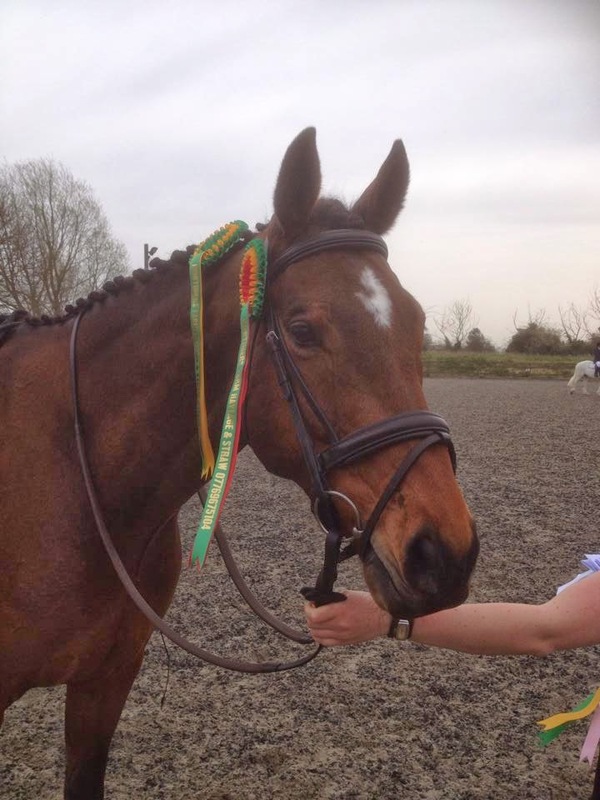 Not only are the pair of them clearly going from strength to strength, coming 2nd in their class with 65%, but the judge had this to say:"there was a lot to like about this willing, obedient and active horse". Well done both of you - fantastic work! 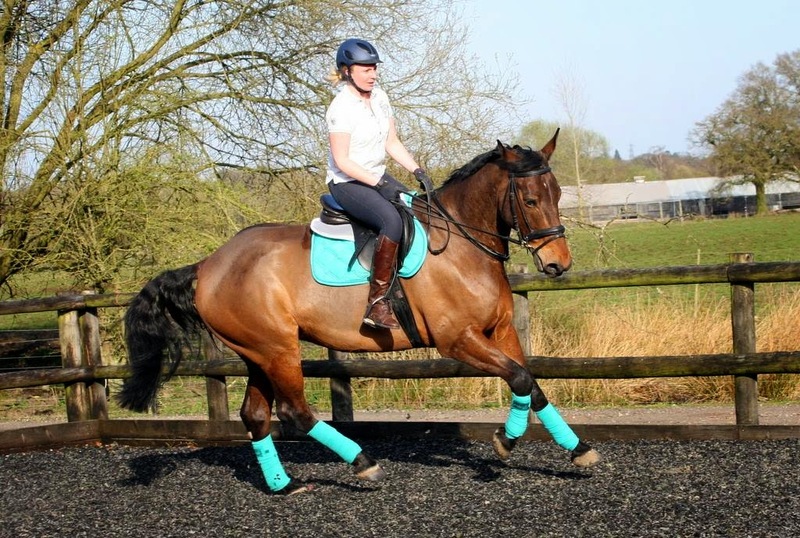 The good weather (though it now seems to be over for now) we had the last couple of weeks seems to have had a a beneficial side-effect, as I've had some great clips of ex-rehab horses sent to me recently. 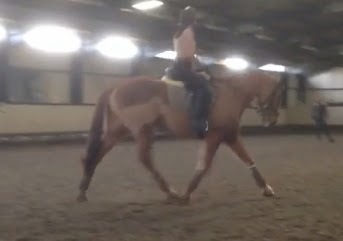 Louise also sent me a lovely clip of Chester who is moving better than ever, though unfortunately being indoors meant its tricky to get good stills. 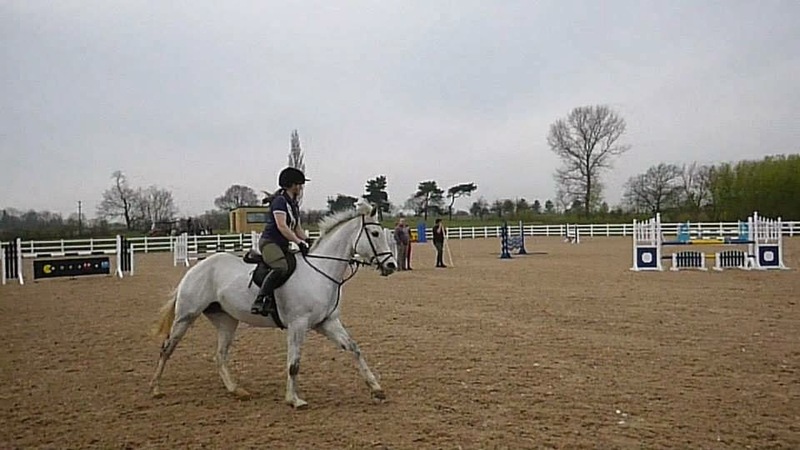 I've also had a fun but very short clip showing Ruby out schooling and also looking very smart - couldn't get a still from that I'm afraid but well done Sarah - she is looking great! More rehab updates over the next few weeks, I am sure! 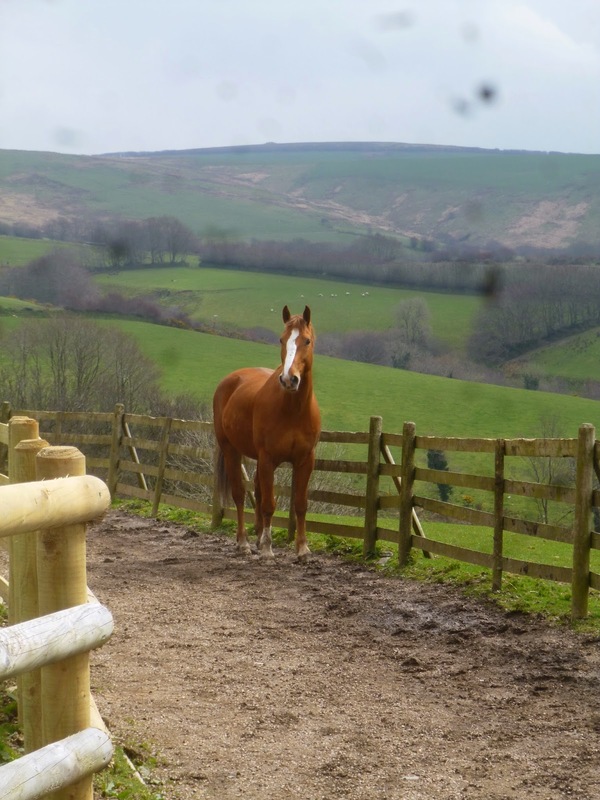 Our latest arrival touched down at Rockley yesterday from Gloucestershire and she has the exotic name of Clementina. 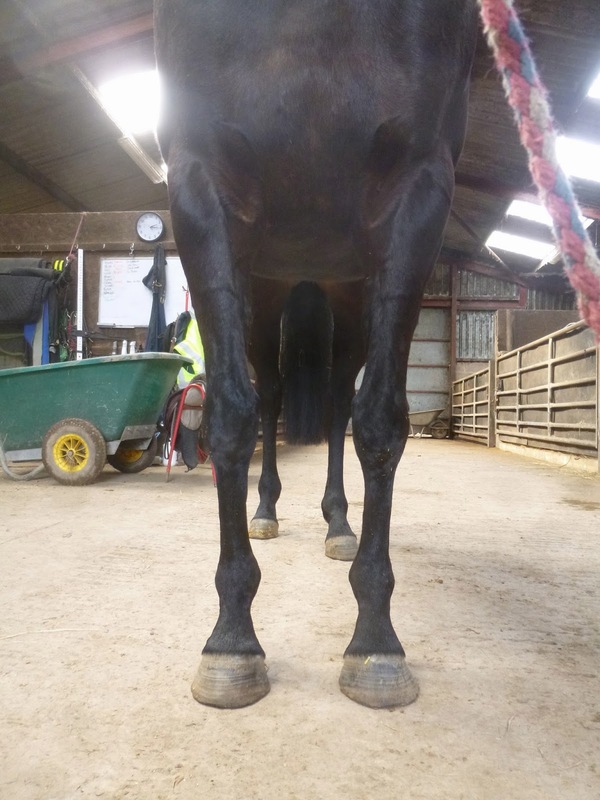 She came out of shoes 5 months ago following an MRI which diagnosed bilateral collateral ligament damage, worse on the RF, together with some navicular bone and DDFT damage. In the months since the MRI Clementina has been without shoes and her dorso-palmar balance has improved. 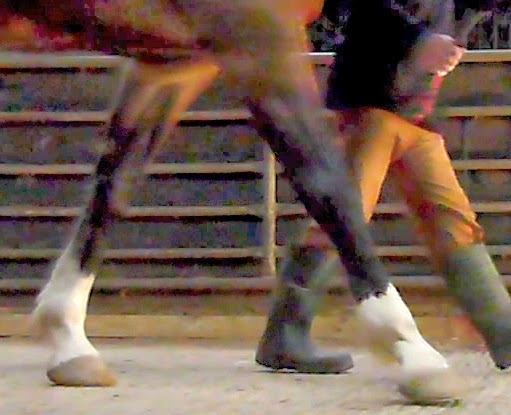 Even though her palmar hoof is still weak her landing has changed from toe first to flat/heel first. 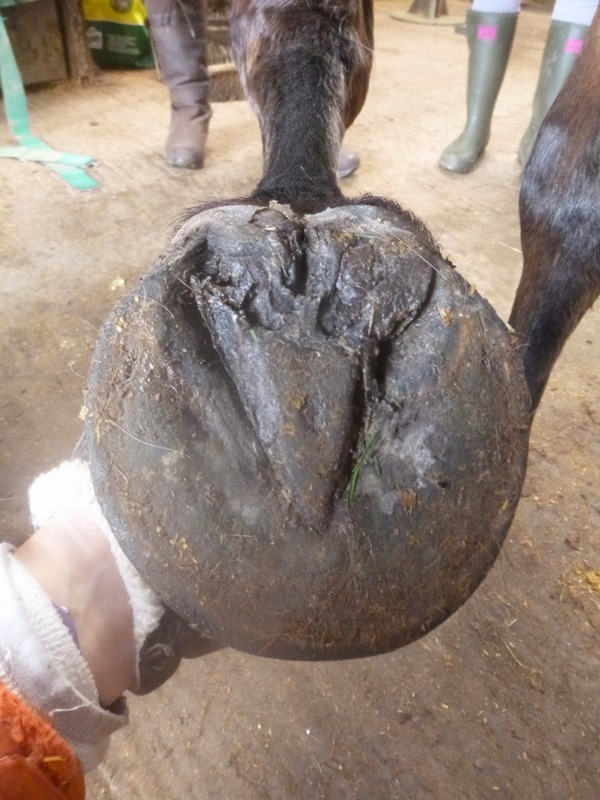 You can also see from this angle that she has better growth in the top inch of her foot but I'd hope to see that improve again over the next few weeks. Clearly from this angle she has a stretched white line but that's not an immediate worry as she has been on a better diet for a few months so what we are seeing at ground level is already several months old. 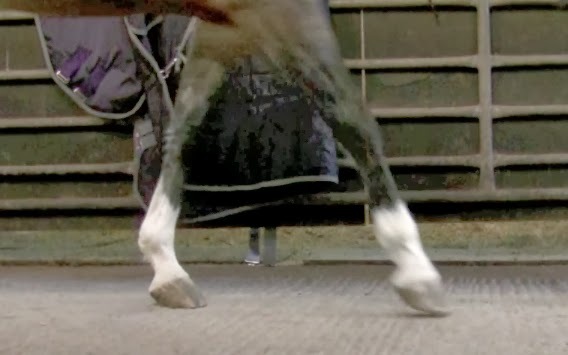 At the moment Clementina's biggest issue is the medio-lateral imbalance which is still causing her to land on the lateral edge of her feet. As the MRI pointed out, this was worse on the RF and that's still the case today. 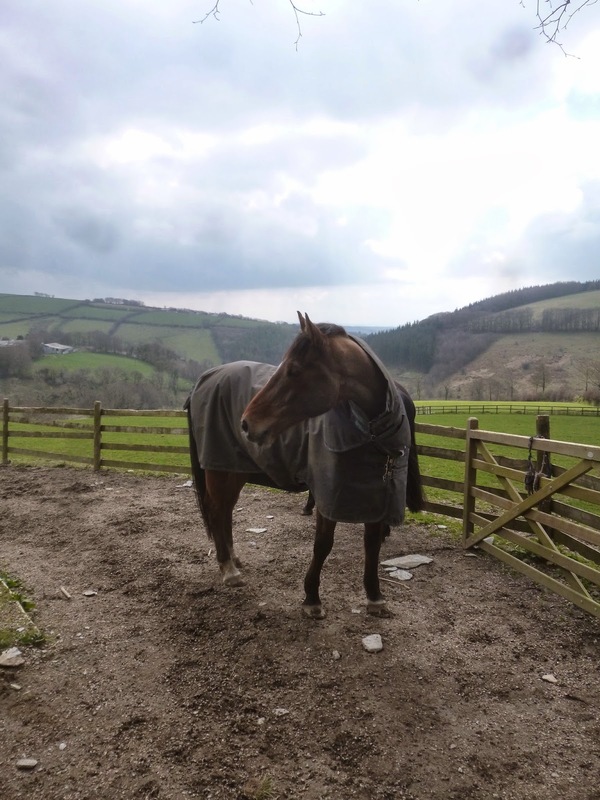 We have plenty to work on but she and owner Judith have made great progress so far - lets hope we can help them get even further. I'm sorry these pictures are a bit blurry - they are stills grabbed from Brigitte's footage - but they are interesting because they show a clear progression in how her landing is changing. The top photo shows her on arrival, nearly 4 months ago now. Many horses change from toe first to heel first much more quickly than this but Brigitte had been landing badly, we suspect, for a considerable time. 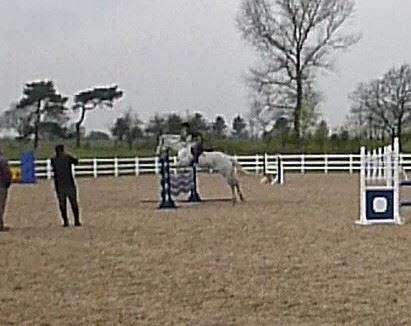 She had also been on a prolonged period of box rest which may well have contributed to her being "stuck" in a toe first landing for longer than most. 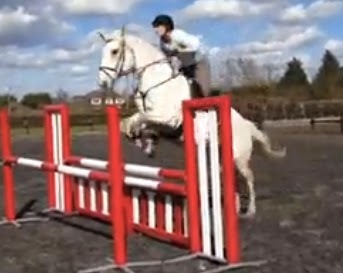 In February (above) she had started to land much better and was able to benefit from work on tougher surfaces. By the middle of March, this is where she had got to - a clear heel first landing on her RF though her LF hasn't quite caught up. Its improving steadily though so a bilateral heel first landing should be just round the corner. 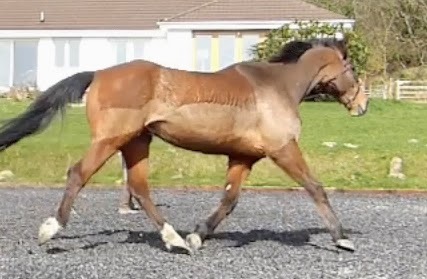 As with Gemini, who was on the blog yesterday as well, notice the increased stride length now that she can land heel first. 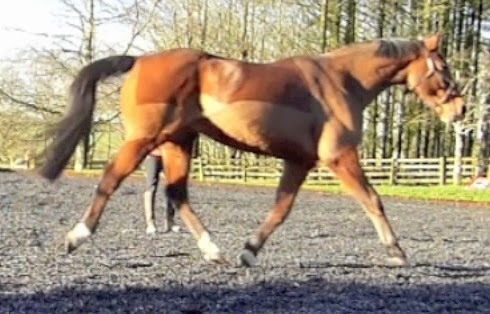 In fact full extension isn't possible with a flat or toe first landing, which is why so many owners report their horse becoming "short-striding" or "shuffly" (especially down hill) way before a clear lameness is evident. Brigitte landing from Nic Barker on Vimeo. Gemini has now been here for a month so time for her update photos. She has already improved her landing as I posted earlier. You can see from this angle that she has shortened her toe and that her heels are already less under-run. Her sole shots are interesting, as she had apparently flat feet but with good collateral groove depth suggesting that her feet actually had better concavity than her flat sole suggested. 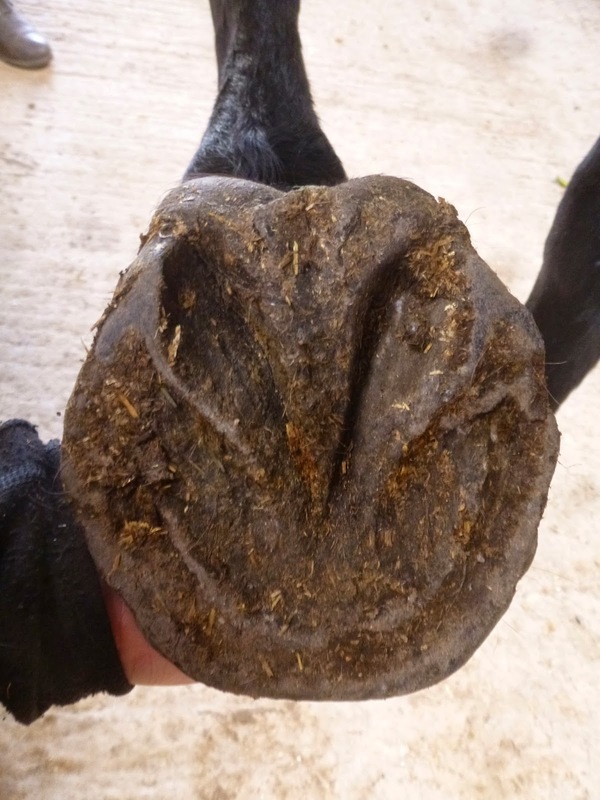 Sure enough, the false sole has started to disappear and you can clearly see that she will have a very strong heel and frog once her foot has fully developed. From this angle her foot is also rebalancing and the medial distortion looks to be improving, which is confirmed by her better landing. 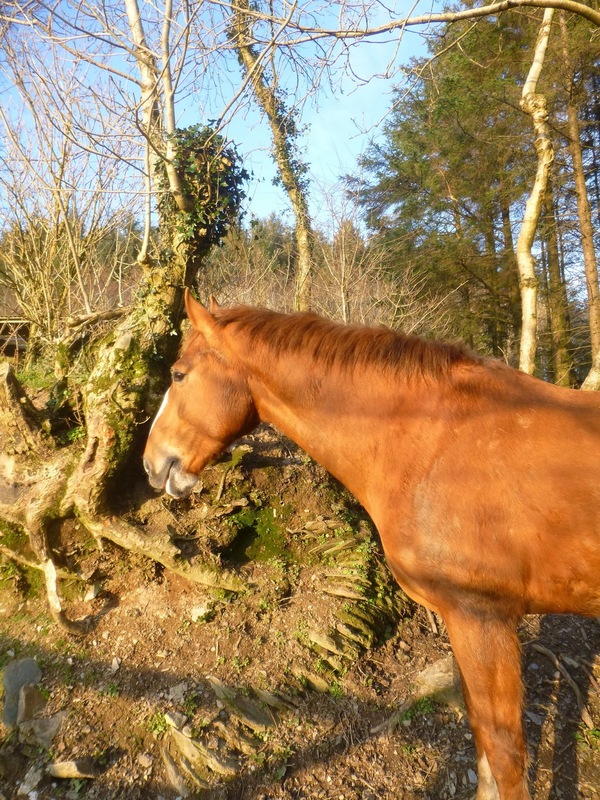 ...but as well as all the normal yard jobs and exercising horses (and goodness, what a difference the sunshine has made!) there are fields to roll and liming and muck-spreading to be done. I'm afraid the blog has to take a back seat this week - this incredible weather isn't going to last for ever! Roger has now been here for 8 weeks - time for an update! I made the most of the sunshine yesterday to begin catching up on footage which I haven't been able to take in the previous stormy, wet weeks of this year. For Roger, it was January when I last managed to film him on a circle and I was convinced he was moving better but it was nice to compare the films and make sure. Roger arrived with DDFT and check ligament damage and its nice to see him moving more comfortably. I've included stills in this post (January is above and March below) and if you compare how he is stepping under with his LH, and the extension of his RF, you can see the improvement. However, its not really until you see him moving that you get a full impression of what has changed. Roger - circle footage from Nic Barker on Vimeo. After a great weekend, when I went to Belfast to meet a fabulous group of horse owners and give a seminar on Saturday, I got home yesterday to find that Spring had properly sprung. It was wonderful to see even the clipped horses out of their rugs in the sunshine and revelling in the lovely weather and we were very fortunate to have good weather in Belfast too on Saturday, which made assessing horses and talking about biomechanics and hooves all day much more comfortable. I have to give a huge thank you here to Helen Spence who asked me over in the first place and to Nola and Hilary who hosted us so welcomingly - along with their and Elaine's patient horses - and supplied us with limitless tea, cake and coffee. 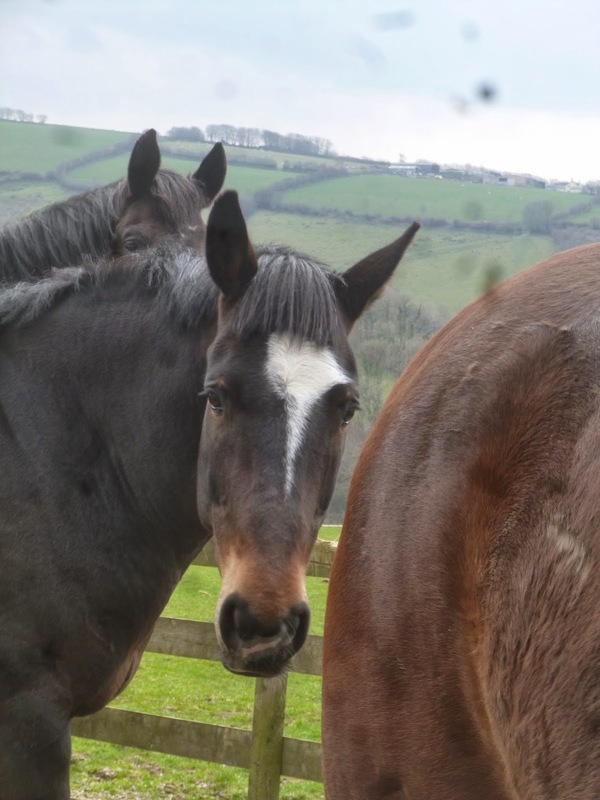 We talked about so many aspects of horses and hoofcare, from tracks to feed and hooves to tack, and it was - just like the RRR - fantastic to get a like-minded group of owners together to share ideas, tips and advice. 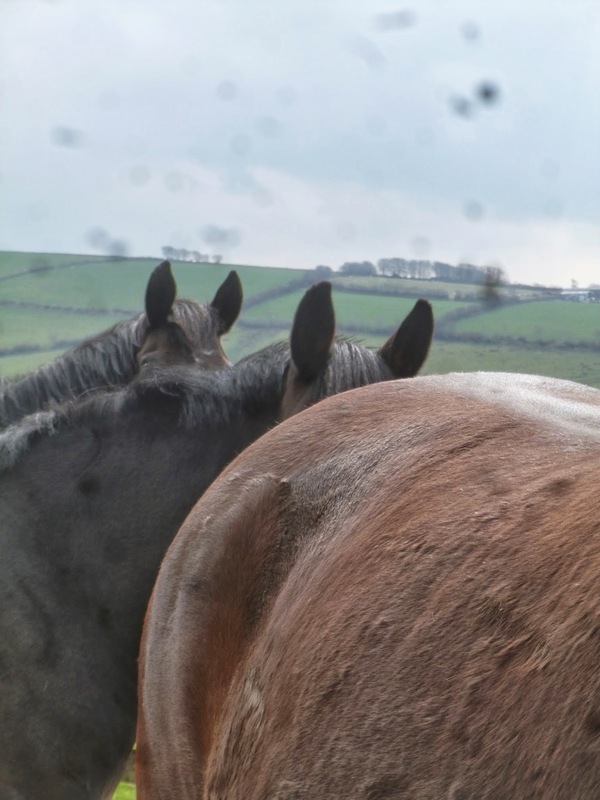 I hope to see you all again and, in the meantime, have a wonderful spring and summer with your horses! PS: Its likely that I will be doing another seminar in April/May - probably in Hampshire. I will put details up here as soon as we have ironed them out! 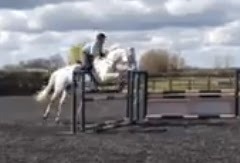 New horse Holly arrived at the weekend and it was immediately clear why she has had soundness issues over the last year or so. From this angle you can clearly see that her LF (which has also been diagnosed on MRI with DDFT damage) has a medio lateral imbalance which has led to her landing on the lateral side of the foot. 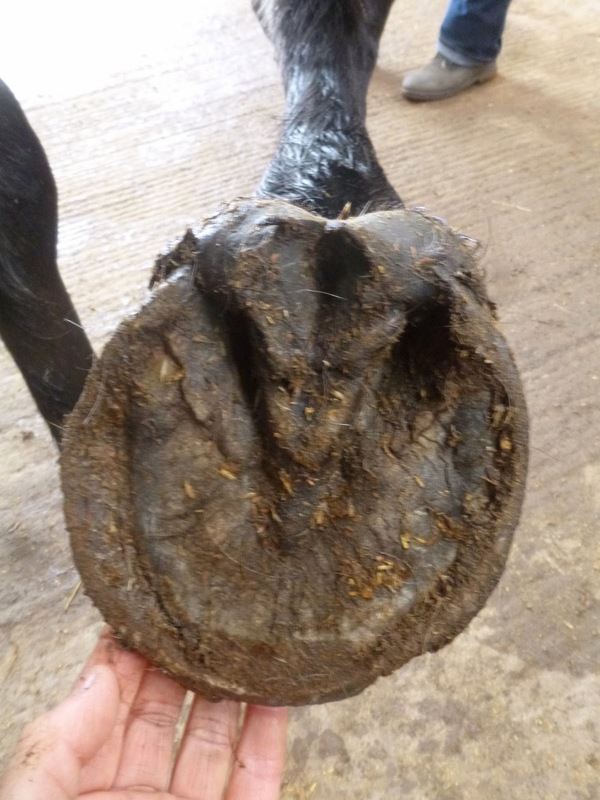 From the lateral aspect it doesn't look too bad - the ridge in the lower half of the hoof capsule arose when she was taken out of shoes some 6 months ago. 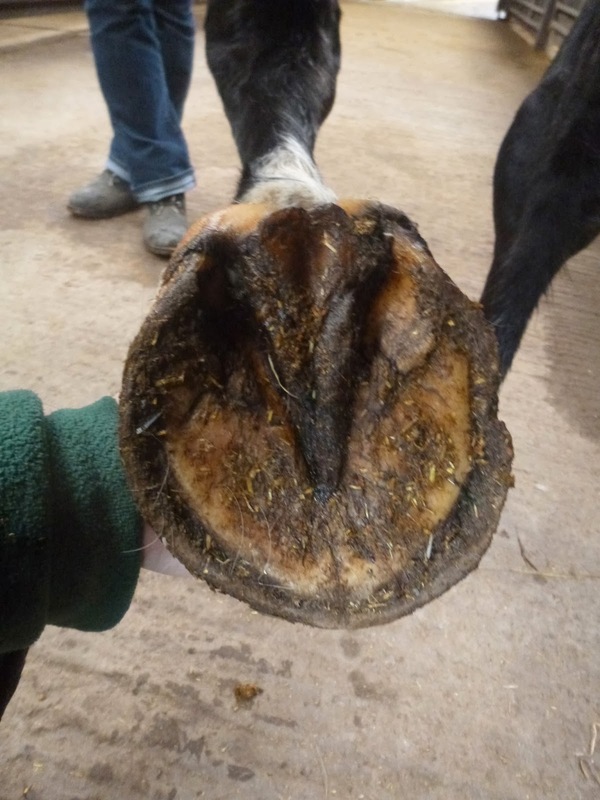 Her feet have obviously been growing quite slowly as she hasn't been in work but on the plus side her hooves are less under-run and she has developed some palmar hoof strength.